Heat and humidity will continue to build over New Jersey in the coming days, with an extended stretch of 90+ degree temperatures in the forecast. There's no other way to say it... This is a hot and humid forecast! 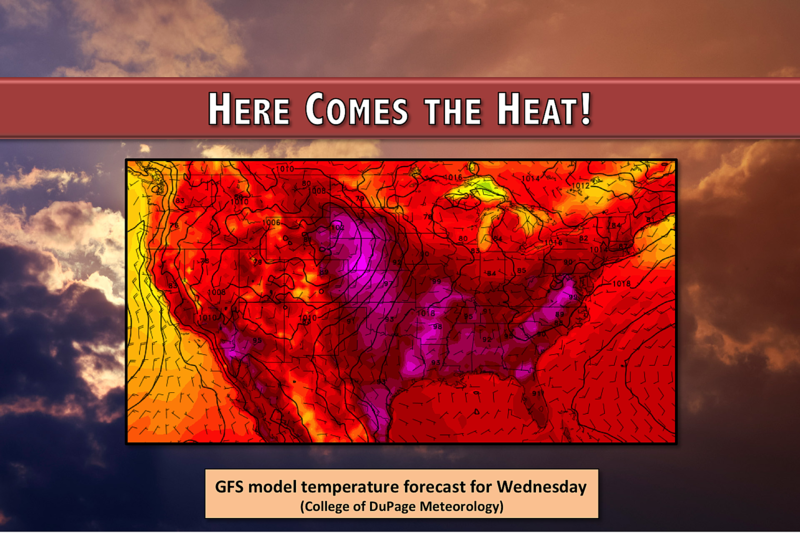 We saw sporadic 90s on the temperature map on Tuesday. That jump-started another New Jersey heat wave that may not break until next Tuesday. Morning temperatures will be in the 70s for the next several days. That's not cool at all. In fact, some of our upcoming mornings will be quite disgusting, with temperatures closer to 80 degrees. Yuck. For Wednesday, temperatures will top out near 90 degrees for most of the Garden State. The beaches will be a little bit cooler, but probably still in the 80s. Skies will generally become mostly sunny. The National Weather Service has issued a Heat Advisory for the NYC metro area, from 11 a.m. Wednesday through 6 p.m. Thursday. This includes Bergen, Essex, Hudson, eastern Passaic, and Union counties. I wouldn't be surprised if this advisory is extended (in time) and/or expanded (in area) as the heat continues to build. Yet again, we'll have to watch the skies Wednesday afternoon as spotty thunderstorms will be possible. It looks like the best forcing for these popup storms will be in the southern half of the state, below Interstate 195. As I've been stressing for the past few days, any storms will be isolated, with the potential for localized heavy rain, lightning and thunder, and maybe marginally gusty winds. Thursday looks even hotter and more humid, with high temperatures spiking into the lower to mid 90s. That's right on the edge of "dangerous" heat. It will be the kind of day where even Jersey Shore beaches touch 90+ degrees at some point. Skies will go from mostly to partly sunny. I'm keeping Thursday's forecast dry for now, with a minimal "blip" of potential rain showing up on the forecast models. Hardly even worth mentioning. On Friday, a weak front will push through New Jersey. That front could spark a quick shower or thunderstorm, although most of the state will (again) remain rain-free. Behind that front, we'll get a taste of somewhat drier air — humidity levels will decrease one or two notches by late Friday afternoon. (For those playing along at home, dew points are expected to fall from the mid 70s to the mid 60s.) Don't expect a cooldown though, as Friday will remain quite hot. Highs will once again reach the lower to mid 90s. Friday could even be the hottest day of this stretch, as drier air warms up quicker than humid air. For the weekend, we'll get some help to mitigate the heat. Clouds will increase on Saturday, leading to a chance for scattered rain from late Saturday into Sunday. It's a good thing! As Jersey's forecast turns cloudier and wetter, the heat will really surge to our south. If not for the grayer weather, we might be talking about thermometers approaching 100 degrees. Monday looks hot too, near 90 degrees for the 7th day in a row. Then a cold front will sweep rain and thunderstorms through the Garden State, followed by cooler air. The temperature forecast for Tuesday will be 5 to 10 degrees cooler, in the 80s, with dramatically lower humidity. Certainly a breath of fresh air, after a long stretch of hot and humid weather.